The ancient family of Fox in England with branches in America and other countries is of Norman-French origin. Its name is derived from the French word “Reynard” which translated into old Anglo-Saxon before 1272 (and now modern English) means “fox”. At an early date one branch of the Fox family settled in Buckinghamshire at Great Missenden. Henry Fox of Missenden was born about 1521 and married a Miss Hawes in 1544. His descendants operated a fleet of merchant ships in the 1600’s which traded with the colonists in Virginia. The king of England in 1660 gave a 1000 acre grant of land in Virginia to John Fox, Sr., Mariner. Twelve generations after Henry Fox of Missenden was born, John Fox, Jr. settled on the land in Virginia which had been granted to his father. In 1894 one of John Fox’s descendants, my great-great grandfather, Henry Fox (1772-1848) together with his married children and their families, their in-laws, many cousins and friends, made up a huge wagon train that traveled from Richland County, South Carolina via Tennessee and Alabama to northern Mississippi. There were enough members of this wagon train to take up land that would make four counties. Henry Fox had four great-grandsons who came to Texas. Alfred Fox, born 1835 in Brandon, Mississippi, operated stagecoach lines from Rusk, Texas and was a telegraph operator soon after the railroad came through Grapeland. 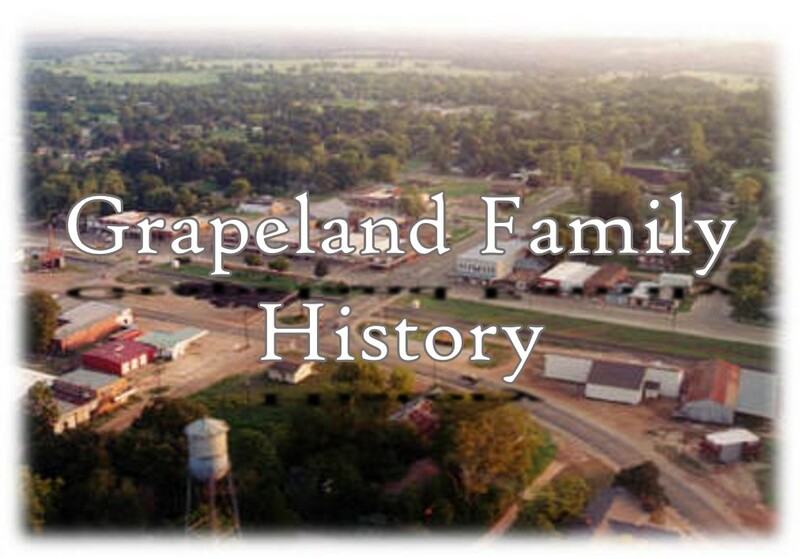 He lived in Grapeland for several years and later settled at Waco. Thomas J. Fox. Born in 1845 in Brandon, Mississippi came to Grapeland as a telegraph operator in the early 1880’s. He decided to make the area his home and settled on a farm at what was then Trinity Chapel. Around 1900 a post office was established in the Kent store and the name, Trinity Chapel, was changed to Reynard. One of Tom Fox’s daughters, Maude, married Lonnie Kent. Another daughter, Margaret (Maggie) married Pat Fulgham. His son, Ted Fox, married Zelda Herod. A third brother, Malachi Fox, born in 1845, went to Vernon, Texas where he was sheriff for many years. The fourth brother to come to Texas was my father, Will Leon Fox, born January 2, 1870 at Fanning, Mississippi. He was the last child of his father’s two sets of children – six in the first set – nine in the last set. He came to Texas to be the best man at the wedding of Maude Fox and Lonnie Kent. He met my mother, Martha Gertrude Meriwether, born February 12, 1882, at Reynard and kept coming back to Texas to court her. They married in September 4, 1912. They had one child, Laura Eleanor Fox – me. My father by profession was a newspaper man and after a few years at Reynard he moved his family to San Angelo and then to Shiner where he went back to his work in the newspaper office. We moved back to Reynard and the farm in 1934. My father died on August 11, 1946 and my mother died on June 21, 1963. Both are buried at Daly’s. I married Milo Pennington on December 27, 1947. He was born February 27, 1911, the son of Harden and Flora Lively Pennington. We have one son, John William, adopted, born February 24, 1943. He married Wanda Hall of Elkhart on April 4, 1964 and they have five children: Angela, (10-19-66), Laura (12-6-67), Vanessa (12-6-69), Robert, (8-20-71), and Christine (2-9-85). Milo and I lived at Redtown, a community near Elkhart, Texas, until 1982 when we sold the farm and moved to Elkhart. Now he is a retired farmer rancher and I am a retired teacher.